The Asian Journal of Business Accounting (AJBA) is proud to present the second issue of Volume 11 which includes a diverse selection of articles written by scholars from Australia, Japan, Sri Lanka, India, Thailand, Pakistan, Indonesia and Malaysia. This issue carries a variety of topics ranging from business, management and accounting related issues to sustainability transition, all of which have reached an unprecedented scale involving many stakeholders. This issue is also timely, in view of the United Nations General Assembly movement towards its sustainable development 2030 agenda which aims to balance the economic, environmental and social needs of the world, thereby empowering future generations with prosperity. In an era where financial sustainability is a fundamental necessity, the capital structure of a company plays a crucial role. Focussing on the agency theory, the first article written by Sinnadurai presents a vision for researchers from the ASEAN region. It seeks to improve the understanding of the effectiveness of the agency mechanism and how its effectiveness differs depending on contextual settings. 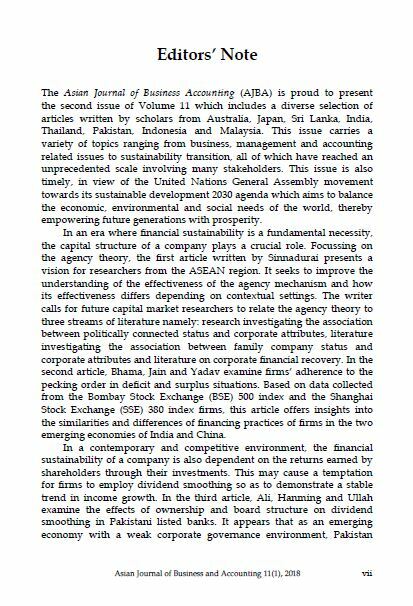 The writer calls for future capital market researchers to relate the agency theory to three streams of literature namely: research investigating the association between politically connected status and corporate attributes, literature investigating the association between family company status and corporate attributes and literature on corporate financial recovery. In the second article, Bhama, Jain and Yadav examine firms’ adherence to the pecking order in deficit and surplus situations. Based on data collected from the Bombay Stock Exchange (BSE) 500 index and the Shanghai Stock Exchange (SSE) 380 index firms, this article offers insights into the similarities and differences of financing practices of firms in the two emerging economies of India and China. In a contemporary and competitive environment, the financial sustainability of a company is also dependent on the returns earned by shareholders through their investments. This may cause a temptation for firms to employ dividend smoothing so as to demonstrate a stable trend in income growth. In the third article, Ali, Hanming and Ullah examine the effects of ownership and board structure on dividend smoothing in Pakistani listed banks. It appears that as an emerging economy with a weak corporate governance environment, Pakistan has some discrepancies. The paper notes that the dividend-paying behaviour of Pakistani banks is unlike that of developed countries. Likewise, to maintain a strong economy growth, it is necessary for firms to utilise a systematic, analytical and thorough capital budgeting practice that is also sound in judgment. Taking this into account, the fourth article by Kengatharan and Nurullah looks at the application of budgeting practices and influence of firm characteristics on the choice of these practices in Sri Lanka. While there is a widespread use of sophisticated capital budgeting practices within emerging economies due to higher uncertain environment, firms in Sri Lanka were still using less traditional and less complex methods. Today’s world recognises the close link that exists between a country’s economy and its social environment. Indeed, international communities have a growing interest in sustainable development which not only emphasises on economic or financial sustainability but also respect for the social environment. To support economic sustainability, firms may supplement standard financial accounting and reporting with some elements of social accounting such as human capital development, productivity, research and development and philanthropy. In line with this trend, the next article by Yoong, Bojei, Osman and Hashim examines perceived self-efficacy and its role in fostering proenvironmental attitude and behaviours. Based on the data of 500 individuals in Malaysia, the analysis suggests that marketers and policy makers should include attitude change campaigns and intervention programmes. This can help to increase self-efficacy among individuals who engage in more challenging environmental behaviours. Whilst many people associate sustainability with “going green”, the concept of sustainability thinking involves both the environment and the impact of companies’ operations on employees. In the sixth article, Wongboonsin, Dejprasetsri, Krabuanrat, Roongrerngsuke, Srivannaboon and Phiromswad explore the influence of social support in the workplace on employees’ intention to quit working. Focussing on Thailand’s food service industry, this paper is timely, in view of the Global Reporting Initiative (GTI) which had highlighted employees’ turnover rate to be one of the emerging issues in sustainability. Turnover is an undesirable event for employers due to the high cost of recruitment and training as well as the loss of productivity. Without doubt, organisations with low employee turnover rate would be more productive and profitable. This not only increases employment opportunities but also promotes a positive social change. Looking at the contemporary workplace setting, it appears that companies not only have to provide social support to sustain employees, they also need to use different forms of control system. On this note, the seventh article by Ludji experimentally examines the relationship between relative performance information (RPI), goal setting and work performance. His study finds that there is an interaction between RPI and goal commitment where the positive effect of RPI on performance was more pronounced in a condition when the individual’s goal commitment is high. Subsequent to this, the rapid development of ICT has also been supporting sustainability by way of virtual communities. This social media platform have helped to accelerate the growth of human beings which act as bridges, filling up the digital gaps and providing equality by enabling knowledge transfer. Given the important role virtual communities play in today’s knowledge sharing practices, Usman and Yennita examine how two different groups of Wikipedia users from Italy and Indonesia engage in the Wikipedia as a virtual platform. The paper observes that the tremendous growth of the ICT has made social media a popular platform for interactions as well as business activities. In the following article, Nghiêm-Phú investigates why and how Vietnamese customers purchase grey (unofficial parallel imported) products on Facebook, currently an expanding market for Vietnam. It helps to fulfil the diverse needs of the Vietnamese consumers whose income has improved but whose needs are not satisfied. While buyers and brand owners have actually benefited from the grey market, foreign retailers and brand owners who are and will be potentially entering the Vietnamese retail market may be affected by it. Further to this, under sustainable development, culture has been categorised as one of the social dimensions listed under the three pillars of sustainability. Culture is regarded as a fundamental issue which acts as a precondition towards the achievement of the Sustainable Development Goals 2030 Agenda. In line with this, the final paper by Moghavvemi and Musa examine how differences in Islamic religiosity practices and beliefs of the two cultures of Iran and Malaysia, influence their preferences towards tourism products and services. To bring this note to a conclusion, we hereby would like to thank the Malaysian Accountancy Research and Education Foundation as well as the Malaysian Ministry of Higher Education for the financial support extended to us. We also wish to express our appreciations to the members of the editorial and advisory boards as well as the reviewers for their time and effort put into AJBA. Happy reading and have a great 2019!